After my last style post, I had a few people ask me about my hair and what products I use, so today's post is going to be dedicated to all things hair products! My obsession with styling my hair started at a very young age. I grew up watching my grandma and mom get their hair done at the salon and even got my first and only perm at age 8. I totally blame my mom for that. I started coloring my hair at the ripe old age of 13 with a few blonde highlights and I've been coloring my hair ever since. I also blame my mom for that as well, but it's a good thing because my natural color is what you could call "dishwater blonde". It's a very light ashy brown with blonde highlights and folks, it ain't pretty. But I digress...this post is about my current product lineup so let's jump in! Allow me to preface my list with the idea that the products I use always vary depending on the current condition of my hair. I get quite a few recommendations from my fabulous stylist and they are always spot on. 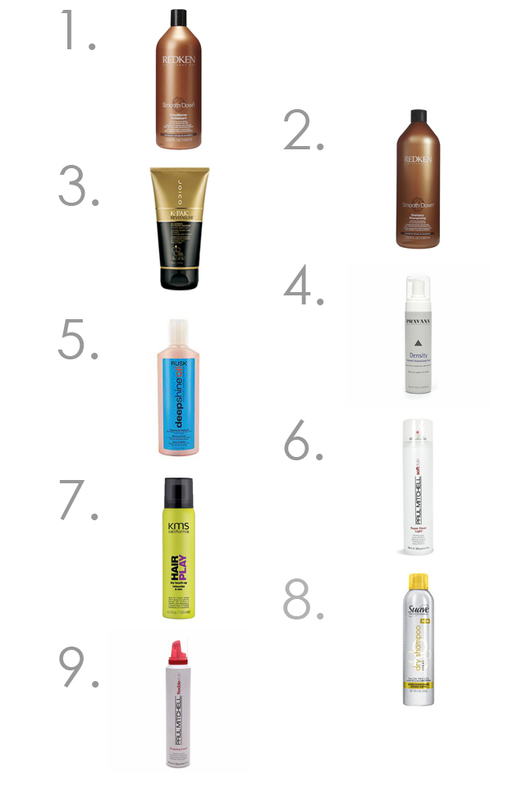 Here is a breakdown of the hair products I'm currently using. 3. Joico K-Pak Revitaluxe - this is my deep conditioning treatment that I use either 1x/week or 1x/every other week in place of my Redken conditioner, depending on how dry my hair feels. 4. Pravana Density Extreme Volumizing Foam - I use this after I wash my hair and after I've towel dried it for 10-15 minutes. 5. Rusk Deep Shine Oil - I use this after I apply the volumizing foam while my hair is still damp and before I blow dry and style it. It helps protect it from some of the damage that comes from heat styling your hair. I also use this product after I flat iron my hair before I apply hair spray and finishing spray. 6. Paul Mitchell Super Clean Light Finishing Spray - It's always nice to add a bit of hair spray after heat styling just to keep things in place. This is a pretty light hair spray but I like it because I can still run my fingers or a brush through my hair after using it. I've been using Paul Mitchell hair spray for years. 7. KMS Hair Play Dry Touch-Up - My stylist uses this on my hair as a final finishing step after styling and I finally caved and bought it. I use this spray as a last step after I've styled my hair but I also love to use it when I wear my hair in a bun. It adds just the right amount of shine, especially if you've used a heavier hair spray to keep things in place. 8. Suave Dry Shampoo - This product is my BFF in between washes or when I want to add extra volume, it's incredibly inexpensive and it smells good. I'm pretty picky when it comes to how my hair products smell and after trying a few different dry shampoos, I decided this one is my absolute favorite. AND they sell it at Target. Added bonus. 9. Paul Mitchell Flexible Style Sculpting Foam - I used to think this was a regular mousse and I used it for years thinking it was helping to volumize my hair. Then I realized it was actually a conditioning foam and it's pretty much the only product that helps my hair when it's filled with static or feels really dry. I use it as needed and as per my usual requirement, it smells absolutely amazing. *I always use pomade every once in a while to tame flyways, but I don't have any brand recommendations for that. Pretty much any pomade will do, just be careful how much you apply. A little goes a long way!